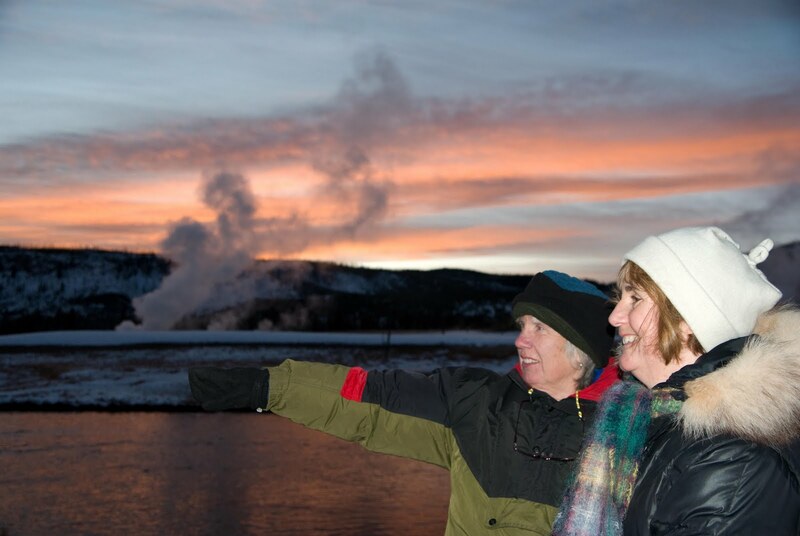 This past weekend, I had the privilege of taking my mother and Mary Youderian (a lifelong friend) on an all-expenses paid (including lodging) guided tour of Central Yellowstone. I, as the guide, do not guarantee the sighting of wolves on such trips, but as my ma and Mary found out, it can happen. The morning started out regular enough. On my way out of the park to pick up the two mothers, I checked wolf signals, as I do every day. Nothing was heard, but just as I was about to exit the park, I saw a gray moving blob in the distance (this is usually what wolves look like...big gray moving blobs). Out of the woods trotted an uncollared, unknown pack...three gray wolves and four black. In the front, the grays bounded ahead, leading the pack across an opening near the Madison River. 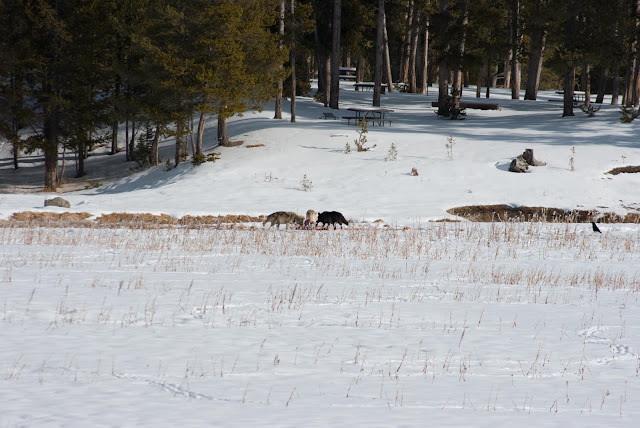 Trailing in the back, the three blacks followed, with a smaller pup and a gray muzzled older wolf picking up the rear (both of which looked weary of traveling). Although my ma and Mary did not see these wolves, they were a foreshadow of what was to come. The mothers had picked the perfect two days to visit. I have not seen such beautiful mornings, afternoons, and evenings thus far. I took them through our usual routine of checking wolf signals and then hiked in on a collared elk to perform a random group composition (which was unsuccessful) in the Firehole drainage. On our way back to the car, amidst geyser steam and a brilliant sunset, a black wolf appeared in the distance and trotted to within a hundred meters of us. Veering off its course after seeing us, it disappeared into the trees. This wolf was Mary's first. The next morning, we drove up the Gibbon drainage to check wolf signals. There were definitely wolves in the area as the beeping on my receiver and the tracks on the roadside made clear. In an attempt to triangulate the collared wolves location, we happened upon a very large gray wolf galumphing up the road. It basically ignored us as it passed by. I noticed on its cheek some red blood, and it proceeded to wipe its face in the snow right next to us. We followed the wolf as it went up the road and down into the valley below. We then headed toward home, making one more stop to try another triangulation. From down the road, a black wolf suddenly appeared. It crossed the meadow and stopped at a meaty-red carcass, which I had not noticed before. It seemed to stand guard at the kill, attentively with ears perked, looking into the distance. After watching for some time, we decided to head home. 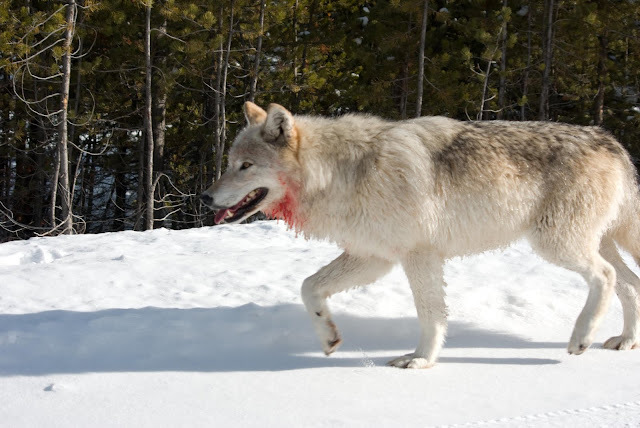 Just as I was folding up the scope, the gray wolf appeared out of no where and lumbered toward the carcass. We watched them both for some time, and then decided to go home. Just as we were pulling out, a white wolf came trotting down the road past us. It too had blood on its white fur. And so, my friends and family, this is a taste of what you can see this winter in Yellowstone for a limited time only! Remember: food, lodging, transportation, and fun provided! Call ahead for reservations!